Don't confuse HB and HP engines... HB engines were produced in Germany by Helmut Bernhardt Feinmechanik and had PDP, Blitz and Stamo models. HP (Hirtenberger Patronen) engines were produced in Austria and now in U.S.A. They have Gold Cup, Silver Star and VT models. These two engines are completely different and no parts interchange. Early HP Gold Cup and late Silver Star .61... Early Gold Cups have a smaller rear bearing, crankshaft and front housing with bearing I.D. measuring 15mm - .590"Ø. Use rear bearing, crankshaft and front housing for silver star if you have this older version. Late Silver Star .61 engines used larger 17mm - .670"Ø. rear bearing. If you have this version use Gold Cup parts. Rotomix carburetor... 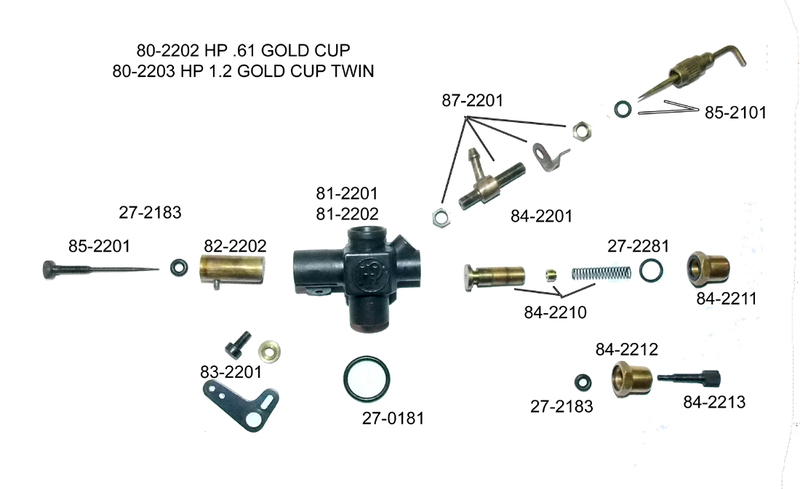 Early Gold Cup and Silver Star 61's used a barrel type carburetor similar in design to a Perry. Later versions use a slide carb. Parts listed are for the slide carb. Call if you need Rotomix parts not listed. The complete carb (80-0101) listed is the K.61 carb which fits the HP 61 perfectly and is sold as original equipment on the new Silver Star .61's. ©2007-1998 Model Engine Corporation of America, All rights reserved.